That is a drop of 9% from 2016 to 2017. It is 9% higher than the numbers from 2015. 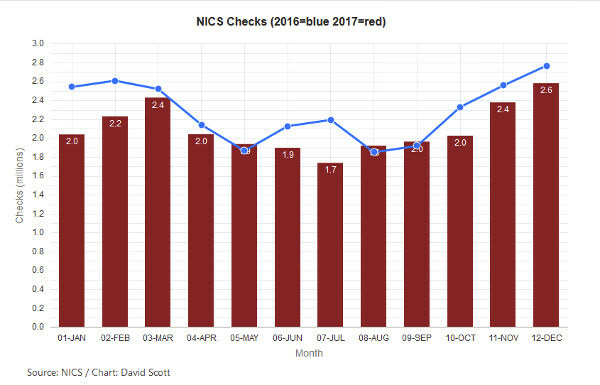 The 2015 numbers are now the third highest NICS numbers on record. December's numbers alone were the fourth highest December on record, behind 2012, 2015, and 2016. Based on performance from the last few years, one hundred NICS checks result in an increase of the private firearms stock in the United States by 56 newly produced or imported firearms. NICS checks are used for more than purchasing new firearms. They are also used to purchase most used firearms. There are 400 million of those in the United States. They are used to do the background checks for new and renewed carry permits all over the United States. Kentucky runs a background check on every carry permit in the state, every month. Multiple purchases of firearms by one person at one time only takes one NICS check. In one half of the states, there is an alternative to the NICS check. People who have a carry permit, which required a NICS check to begin with, are not required to have another NICS check done for firearms that they purchase in those states. Because of these other uses for NICS checks, about 100 NICS checks are done for each 56 new firearms that are added to the private stock in the United States. The ratio is slowly being reduced as more and more uses of NICS are added. A few years ago, 60 new firearms were added to the private stock for each 100 NICS checks. At the 56 firearms per 100 checks ratio, over 14 million firearms have been added to the private stock in 2017. The number of private firearms in the U.S. is now approximately 418 million . The reduction from the overheated firearms market that existed in 2016 is significant. NICS checks dropped by 9%. With that drop, prices of guns and ammunition have also dropped. .22 ammunition is being seen on shelves where it had been mostly absent for 4 years. Bargain prices for modern sporting rifles such as AR-15 clones and good quality pistols have kept the overall numbers from dropping further. 2017 was still the second highest year on record. The pace of firearm sales in 2016 could not be maintained forever. A readjustment was necessary, and it has happened. In a year and a month or two, we will know just how many firearms were added to the private stock in 2017. The ATF is not allowed to release the actual manufacture, import and export numbers for a year, by law. That is to protect the private property rights that exist in the numbers that the manufacturers release to the ATF. The ATF numbers are how the ratio of NICS checks to actual firearms added to the private stock are calculated. Dean, import numbers are released the following year. It is only domestic manufacture that is held for a year. Supposedly due to competitive advantage, but I don't understand it. If a car manufacturer can release yearly, quarterly, or even monthly data in a timely fashion why the BATFE has to withhold firearms data. Makes no sense to me.